Ring of Honor taped television at the 2300 Arena in Philadelphia last night and finished building to next month's Death Before Dishonor pay-per-view. - ROH World Champion Jay Lethal came out and cut a promo. He was interrupted by a video from Will Ospreay where Ospreay challenged him to a title match. Lethal accepted, and Ospreay tweeted that the match will be at Death Before Dishonor in Las Vegas on September 28. Steelz would have gotten a future title shot if she won. After the match, Tenille Dashwood came out and challenged Sakai for the WOH Championship. SCU were very over and won with the Best Meltzer Ever. 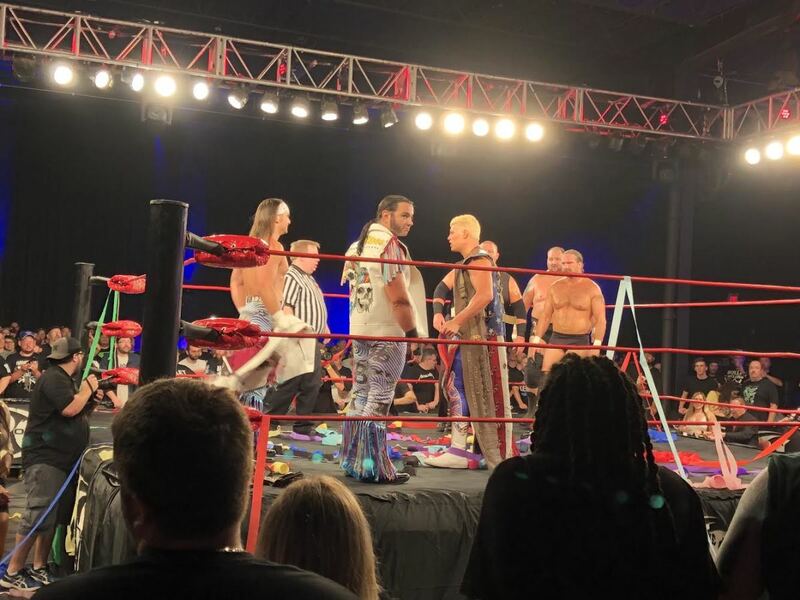 - Ian Riccaboni hosted an in-ring face-off between Cody Rhodes and Nick Aldis ahead of their NWA Worlds Heavyweight Championship match at All In. Cody cut a promo hyping All In and the fans went wild. Aldis said that Cody is grandstanding to give himself false confidence because there’s no way he can dethrone Aldis. Aldis used the Dusty Rhodes “I have been to the mountaintop” line to some big heat. For the finish, Beretta hit the Dudebuster and Chuckie hit the Awful Waffle at the same time. They had a very good match, with King getting the pin with a reversed small package while holding the tights. Page was very over. King has a new gimmick where he came to the ring with inflatable pool toys. - Two wrestlers were facing off in a Top Prospect Tournament match when Jeff Cobb came down to the ring about two minutes in and laid each of them out, including hitting the Tour of the Islands on one. Cobb said the tournament is canceled and he’s the new top prospect. He got a mixed reaction. About a third of the audience knew who he was and reacted big. They built a lot of the story around Bully Ray antagonizing Gresham, but Bully and Lethal also had a very hot striking battle at one point. Tons of hard slaps and chops. Young wound up pinning Gresham with Misery after Bully knocked down the referee and hit Gresham. Dashwood picked up the win with a running kick. Isom rolled up Taylor for the win. Gordon was very popular. Taylor attacked Isom and Sabin after until Gordon ran him off, probably setting up a future match. Ali rolled up O'Ryan at the end of a good back-and-forth match. The Kingdom were furious and beat up the referee before a bunch of security ran down. Solow received the title shot for winning the Amazon Prime Dojo Pro series. He came out with the Dojo Pro Championship belt. I heard maybe one or two individual people shout something about Bayley (Solow's significant other), but the crowd was very respectful and gave him a shot. Bayley was also backstage and was peeking through the curtain watching much of the show. Solow did hit a Bayley-to-Belly for a good near fall, but Martinez retained with the sit-out chokeslam. Helms came out with his green superhero outfit and the mask. A total hero vs. villain style here with Scurll using underhanded tactics and Helms always trying to thwart him and play by the rules. Scurll went for a cradle, but Helms reversed it for the upset/fluke win. Not sure if they’re trying to maybe say that Kazuchika Okada is in Scurll's head or what -- because All In will air much sooner than this match will -- but that’s maybe what it came across as. This was probably the second best match on the show. Pretty tame for a Fight Without Honor. Cheeseburger used a belt to whip Ferrara around the ring. Ferrara worked on the hand to prevent the Shotei. Rhett Titus came down to the ring to beat up Cheeseburger, but Eli Isom and Brian Nova came down and powerbombed him off the apron through a table. Finally, Cheeseburger won with a Shotei with a chain wrapped around his entire hand. This was a pretty crazy six-man, as most Young Bucks trios matches are. The big story was the size of Beer City Bruiser and Milonas vs. the lack of size of the Bucks. They got the heat on Cody before Nick Jackson made his standard lightning hot tag. Cody withstood a bunch of double teams from the super heavyweights, including a superplex and top rope splash combo. Bruiser also did a dive off the post onto all five guys on the floor. The Bucks ran wild with superkicks and then they and Cody hit a big double superkick and a Cross Rhodes on Milonas to retain. After the match, as is customary, they had the Bullet Club/Being the Elite promo with The Bucks, Cody, Hangman Page, Scurll, Brandi Rhodes, Burnard the Business Bear, and Flip Gordon (who is still not All In). Cody repeated his speech about All In and got the fans hyped up, then Scurll sent everyone home by rapping the Fresh Prince of Bel-Air theme. Good show. Not the best ROH tapings I’ve been to, but it was very fun. Everyone who spent any amount of time on Being the Elite were the most over guys on the whole show and there were hundreds of Bullet Club T-shirts all over the crowd.